“For the second time since 2013, the Gila County Republican Party has censured Senator John McCain for his continued lack of adherence to Republican principles and the desires of his Republican constituents in Gila County as well as the extraordinary negative and misleading campaign literature and ads towards a fellow Republican candidate, according to Gila County Republicans Chairman Gary Morris. The censure from the May 14 Precinct Committeemen meeting states, “The Gila County Republican Party cannot, and will not, support Senator McCain in the upcoming elections. “In early fall of 2013, The Gila County GOP first censured McCain for abandoning Republican principles as well as his participation and leadership in the “Gang of Eight” along with the Senator’s conscious and arrogant abandonment of the desires of his Republican constituents. Those eight senators drafted a poorly designed, ill thought out, “Comprehensive Immigration Reform” bill. Ultimately, Congress rejected the bill following substantial opposition from the public. “Following Gila County’s lead in 2013, other Arizona County and Legislative Districts also passed resolutions censuring McCain for his abandonment of Republican principles. That led to the Arizona Republican Party, at its January 24, 2014 State Statutory Meeting, also passing a resolution, by a large margin of votes, to censure the Senator, for his abandonment of Republican principles. 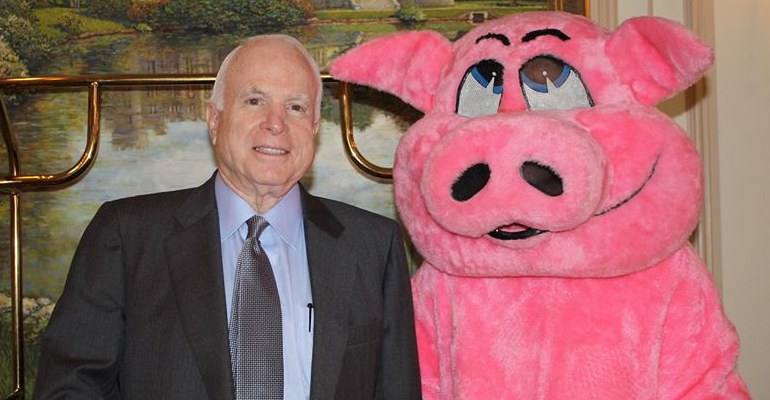 “McCain’s troubles with Arizona Republicans continued. As an unannounced and surprise speaker at the State Statutory Meeting in January, 2015, the Senator was booed and shouted down immediately upon entering the convention hall by more than 800 attendee’s, which continued for several minutes as he attempted to speak. Shouts of “Trust is earned” and “Go home” were repeated over and over. “McCain has continued his arrogant abandonment of Republican principles and the desires of Republican constituents in Gila County, thus the motivation for the second resolution to censure the Senator, according to Morris’s press release. When candidates for office campaign as Republicans, the electorate expects them to commit themselves to Republican principles when in office, and further.